Thirteen (unlucky?) 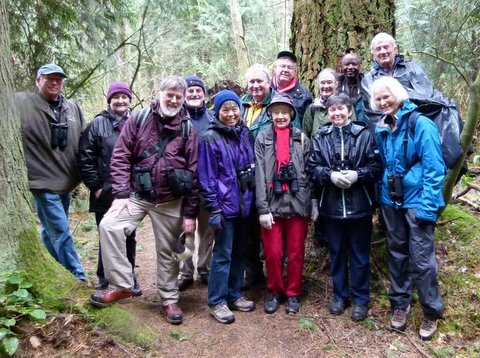 participants spent a drizzly Monday morning at a couple of spots in Pacific Spirit Regional Park (near UBC) and then at nearby Camosun Bog. 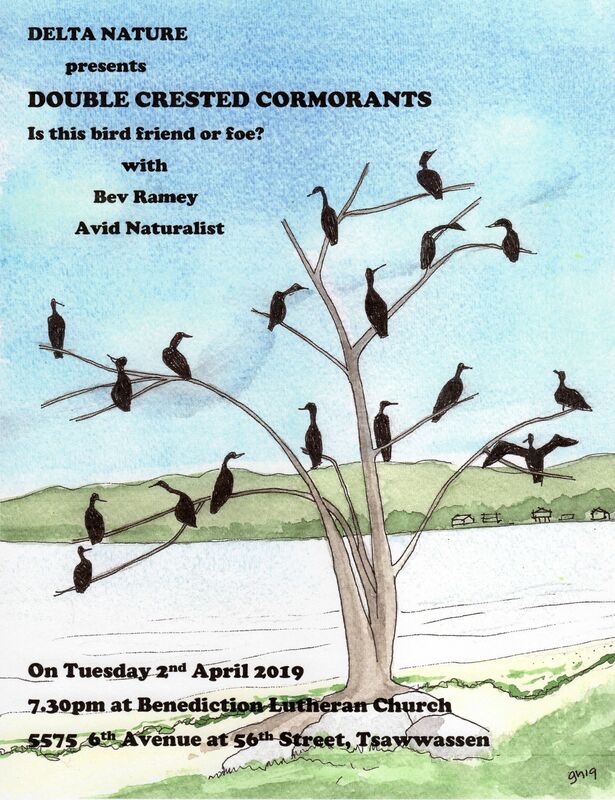 We were: Roger M, Lorna, Kay, Bryan & Janet, Mike B, Surrey’s Gareth P., Gerhard, Jonathan, Eleanor C, our Guru Bev R and her knowledgeable Sidekick Dorothy W. and me. Hi-lites were: Varied Thrushes, Brown Creepers, Chestnut-backed Chickadees and the best hi-lite was Gareth’s wife’s Welsh Cookies. Check out the few photos of our outing (including the Group Photo) on our DNCB Blog (www.dncb.wordpress.com) or our Picasa site at http://picasaweb.google.com/dncbirding. Seven of us left Petra’s at 8:00 a.m. and met the others, including the infamous Bev Ramey, our Guide today, at the Historic Monument near Booming Grounds Creek in Pacific Spirit Regional Park. It was spitting rain at this beautiful Lookout over the Fraser River inlet toward Iona and its long jetty/breakwall. Dorothy spotted an Anna’s Hummingbird for us. We followed the trail along the ridge, interestingly through a bit of old growth forest with some Cedar trees being 250 years old. Pretty quiet birdwise, but we did get good looks at Varied Thrushes and Brown Creepers. Pacific Wrens were singing everywhere from the low shrubs and Golden-crowned Kinglets were calling high above; some got occasional glimpses of these quick little flitters. Marsh Wrens were also singing in the marsh below us, but Bev thought (or was it me?) our group was too “old and frail” to venture down the fairly steep trail to the river’s edge. So we went back to our vehicles and drove to the Park Centre and took the Discovery Trail from the former Metro Vancouver office trailer. With noise from the nearby traffic and the park workers’ machines, it was difficult to hear any birds. We saw a few flocks of Chickadees, with some Chestnut-backed among them. More Kinglets, Creepers and Pine Siskins were also seen. Lots of Woodpecker evidence in the trees, but we only saw a Downy. Bev, Dorothy and Roger pointed out and described a lot of the plant species, but I forget them already. We got back to the parking lot for Smoko and our necks were aching from looking up at LBJ’s (Little Brown Jobs) in the tops of the trees. We forgot about the pain when Lorna brought out her biscuits and PB sandwich, and especially when Gareth passed around his wife’s home-made Welsh Cakes (I have her recipe). We were now fired-up and decided to move on down 16thAve. 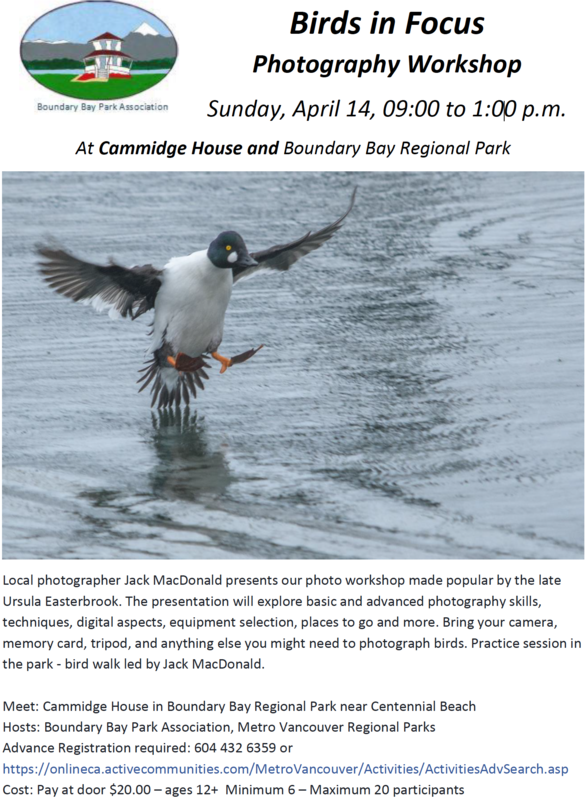 to Camosun Park/Bog. Camosun Bog was equally as uneventful as the rest of the morning. The new boardwalk was sturdy and really well made, the signage was very informative. Some read the signs while Gerhard slept on a bench. Hardly any birds there either; we saw a few Spotted Towhees, a nice Anna’s Hummingbird, more LBJ’s, and Gareth claimed to have seen a Townsend Warbler. I believe him because he brought the cookies. We left this Park around 12:30 p.m. to return to Tsawwassen. 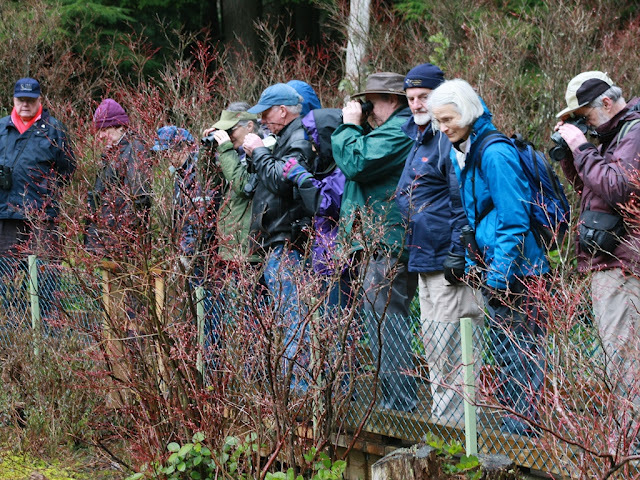 Despite the inclement weather and few neat sightings, everyone claimed to have enjoyed the outing. Anyhow, I did, and our Interpreters Bev and Dorothy were awesome. 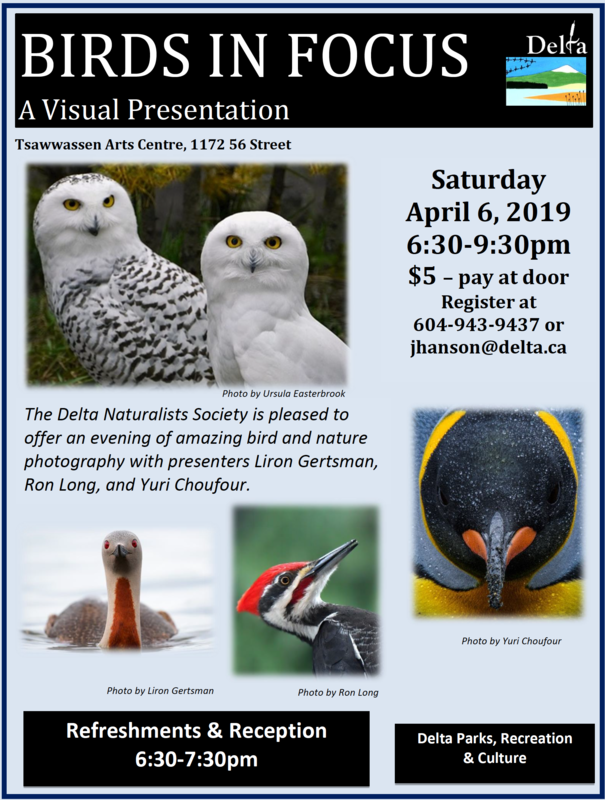 Our next DNCB outing will be Wednesday (not Monday), April 4, leaving Petra’s at 8:00 a.m. Our destination is not yet decided; we “may” go to Minnekhada Park in Coquitlam or Grant Narrows Park at Pitt Lake. Contact me early next week for updated outing details. 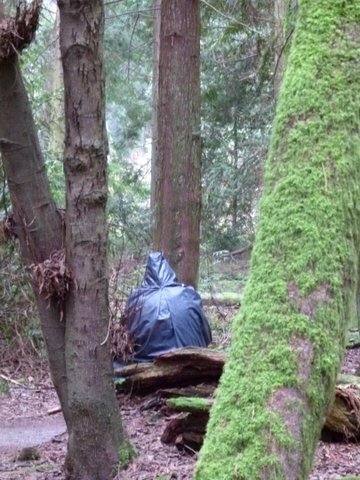 This entry was posted in *DNCB, Camosun Bog, Pacific Spirit. Bookmark the permalink.